When designing for the Web, one must be constantly mindful of the wide variety of Operating System/Browser combinations that are possible, and the varying results in rendering when it comes to these. If you’re a Mac user, you may find it difficult to debug your pages in Internet Explorer without having access to a Windows PC. Luckily, due to the recent move to Intel processors, Mac’s now have a whole bunch of different software solutions for Windows Virtualization, and recent improvements in this field offer even more seamless integration with OS X than ever before. One of the most popular applications for Windows Virtualization on the Mac is Crossover, which is based on WINE. While the premise of this app is great, it simply isn’t stable or reliable enough for repeated use. VMware Fusion has my support as the best Virtualization solution. You choose to either boot up a fully-fledged Windows XP or Vista installation, or just open single applications from the OS. 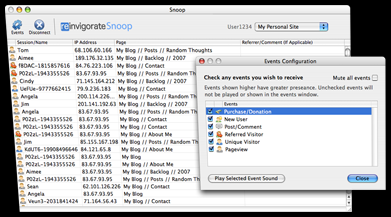 The Windows applications are “unified” with OS X, and are displayed as standard independent windows within the Mac OS. For example, I’ve added icons for Internet Explorer 6 and 7 (both Vista and XP versions) in my Dock, clicking these opens the apps in their own windows, seemingly absent from Windows XP/Vista. Sure, it’s probably not worth throwing out your XP/Vista test box just yet, but if OS X is your only available system, then this certainly will allow for some comprehensive testing across multiple platforms. Today I paid a visit to the Flock Website, in hopes of checking up on how the little jack-of-all-networks browser’s development was coming along. The page that met my eyes left me in a state of puzzlement, shock and disbelief. I was half hoping that it was all some sort of elaborate joke, but alas, it’s all real. 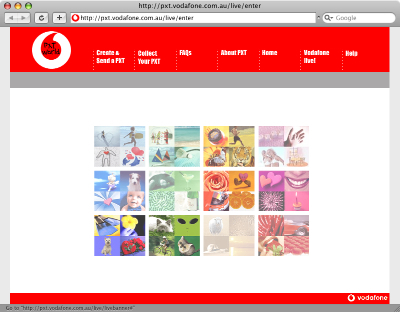 It seems as though the powers that be decided that the “boring” old Flock page needed a facelift. What we see here folks is plastic surgery gone horribly, horribly wrong. These surgeons are clearly not qualified to be hacking and slashing at a once-beautiful Web entity. Thar she blows. 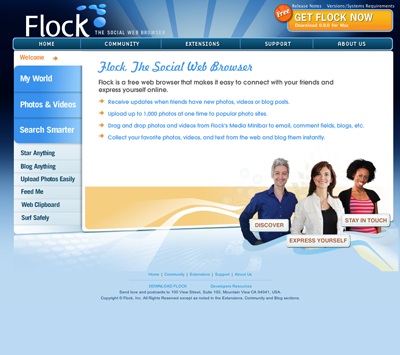 The brand new Flock page. What a colossal disaster. And no, the extent of this apparent trainwreck isn’t just skin deep, oh no. The underlying markup looks like it was printed on A4 paper, shredded and pasted back together again. 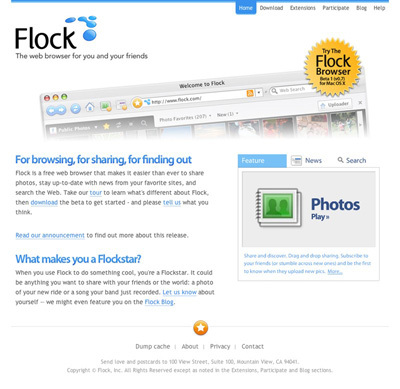 To refresh our memories, here’s a screencap of the “old” Flock design. Skillfully hand-crafted by Bryan Veloso, it embodies the very essence of simplistic beauty. All that Flock stands… or stood for. I, for one, have completely lost faith in the project. I was initially interested in seeing what kind of progress had been made with the browser, but now I just can’t bear to look at the thing. After a lengthy conversation with Evan Hamilton, Flock’s Community Ambassador, I’ve made a discovery or two. It turns out that the new Flock design was actually contracted out to an external agency. Flock have since hired an in-house designer, who, according to Evan will be able to properly communicate their visual ambitions. Evan mentioned the difficulties that arise when contracting a design over a large geographical distance, and I fully understand. I must say, I was very impressed with Evan’s response during our back-and-forth, he was wonderful to chat with, seemed to take notice of my criticism and suggestions, was not offended by this harsh article and just came across as genuine. Consider my faith in the Flock project restored. There’s a great little OS X Application called Get Tube that has proved itself amazingly useful and simple in performing it’s task. Just copy and paste the URL of a YouTube video (it also supports a couple of other video sites) and Get Tube will automatically download and convert it to either an MP4 (MPEG 4 video) or MP3. 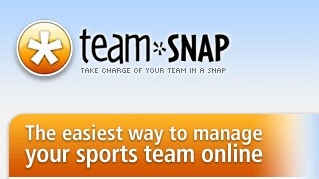 Even though it’s a great program, I’m not too fond of its icon. So, I’ve come up with a simple little replacement icon, to fully justify this great app’s place on my dock. All too often during my hours of performing daily web tasks do I uncover great examples of anti-usability, but they’re usually not to the extent of what I’m about to show you. One would imagine that such a large company as Vodafone, claiming to hold 200 million proportionate customers in 27 markets across 5 continents would at least provide a human-usable experience for a common user path. But alas, they seem to have failed… and not too gracefully. When I am sent a Picture Message (MMS) on my mobile phone, instead of receiving the image itself, I get a SMS message with a link to download my MMS from the Vodafone website. Now, as irritating as this is, this isn’t actually what my post is about. You see, apon visiting this URL in my web browser I am presented with the following. When viewing the aforementioned page at full resolution, my focus is drawn to the absurd flash movie (which actually serves as a menu, unbeknownst to the user) rather than the navigation at the top of the page. After a couple of double-takes and head scratching, I (the average user) finally can avert my gaze from the pretty colours in the middle of screen and make use of the actual navigation bar to get that one step closer to my goal of collecting my “PXT”. Upon further investigation, it turns out that the flash “thing” in the center is actually a navigation menu itself. But, the user can only find out this by hovering over each picture to see what link it holds. On top of that, not every picture is a link, and it feels like a “lucky draw” to get the one you want. So, a certain percentage of this page’s visitors won’t even be able to get to their destination, and even the ones that have all the plugins enabled will still spend more time than they should trying to figure out how to use the thing! When I visit this page, I’m confused as to its purpose. I should be given exactly what I’m looking for, ready to be used. Instead I’m given this convoluted, confusing and unusable page. Focus on the typical user path. 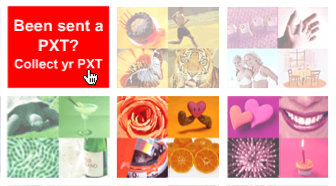 Provide a clear focused link to “Collect your PXT”. As well as the other actions. Completely trash the pointless flash animation. Use a hover state on the navigation, to let the user know that it’s actually clickable. Ditch the annoying “TXT Speak” (“Collect yr PXT” – what a joke!). It’s insulting to the user’s intelligence. Along with a brand new design for WebRevolutionary, I’m going to be releasing a new (free) publicly-available WordPress theme, which has yet to be named. Progress is coming along quite nicely, and I hope to have it released within the next week or so. I’m open for any suggestions, so if you’ve got an opinion or idea, let me know. OK, so I may have been to quick to judge Twitter, having never actually used it to much extent (bar creating an account). So, I’m giving it another shot. The Web is dominated by a handful of behemoth services, that manage to maintain their success as copy-cat products emerge and inevitably fall. This is due to one key factor (overriding anything else) that must be present with a new online product… Uniqueness. It doesn’t come easy however, the path to a popular Web Application is a long, windy and sometimes frightening one, but with a proper attitude and some great ideas, you too can see your product thrive. Here are some tips that I’ve either picked up from personal experience, or observed from the activity of some of the more popular online successes. YouTube was the first video sharing service that broke out into the mainstream market, and it has remained so over quite some time. Many company executives see this success as some sort of popularity raft they can float their own site on, and we now see countless similar sites attempting to chip away at YouTube’s market share. 99% of the time these attempts end in failure, and it’s due to one key factor; there is no room in the market. YouTube was built at a time where video sharing was simply not simple nor intuitive for the general public, and through perseverance (and a virally self-promoting social edge) they eventually filled the filled the gap and reaped the inherit success. There is very little chance that any other product (in the near future) will ever replace YouTube, because simply, our needs for this are fulfilled. Instead of focusing on jumping on the video bandwagon (or any other pre-existing market), you should strive to break into the *next* open market. Nobody will want to use your service if they can already do what they want somewhere else. Try and think about what services you would like to see, something that doesn’t yet exist. Innovate, don’t reciprocate. This is absolutely fundamental to any facet of business. You should build a service in which users can relate to, and thus, you must relate to your users. Be sure to have a good idea of a typical user in your mind, and try and adopt their mindset. This step will be quite difficult if you are detached from this group, so perhaps the best thing to do is to build a product that is close to your needs, the best services are the ones helmed by a passionate creator. On the Web, users want to do what they want in the fastest and easiest manner possible. Your service should be clear in what it provides, and it should provide this fast. Don’t make your users jump through hoops in order to complete their task, and make things logical. Think of what a typical user will want when visiting your site, and make the path to this as short as possible. Above all, your service should do what it is advertised to do, and well. There is nothing more frustrating for a user than a poorly-executed service that is confusing to use. In short. Never give up. Don’t expect to be an overnight success, and be realistic about your goals. This doesn’t mean you should undervalue yourself, but the mindset of a hopeful overnight millionaire is a dangerous one, and one that rarely yields success. Stick by your product, and see it through. Who knows, you might just get there. The design of your site is representative of your service, the typical user will subconsciously decide whether they like your site within a fraction of a second. Therefore, if users can’t relate to your design,they’ll see your product as inferior. What your design should aim to acheive is to influence this slit-second decision in the most positive manner. This is possibly the hardest nut to crack, as design is such a subjective topic. 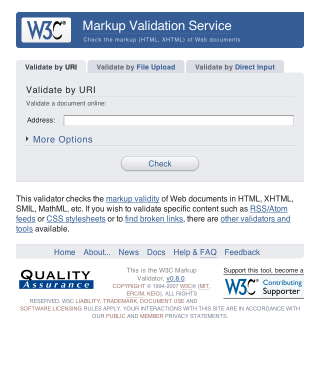 It goes hand in hand with knowing your user, and a skillful Designer or Usability expert should be able to achieve this. Be sure not to pass off design as an afterthought, as embracing a solid design is vital to making your users feel like using your product. Promotion is a massive topic in itself, but I’ll be as brief as I can. People will respond negatively if your product is blatantly promoted in a “cheap” manner. That is, be subtle with your promotion, as most people don’t like being bombarded with your product. The way I see it, is that you want users to want to use your product, steer well clear of forcing people into your site. You cant just squeeze money from your visitors, it must come naturally. Perhaps the most ideal way of monetizing a service, is to make money from your users without them even knowing about it. Your service can turn around some serious dough and still have your visitors using a free service, which is a complete about-face on the traditional product model. The most popular means of this is contextual advertising, and it’s is to make your ads fit seamlessly with the content. After all, ads don’t have to be a pain to view (like those stupid flashing banners of the 90s), and you can still make a buck or two. So, if you have a good, working product that’s well promoted, solidly designed and has a sure-fire monetization strategy, you’re well on your way to success. I’ve never been one to shamelessly promote a specific product, but I found myself compelled to spread the word about a little productivity-boosting app called WriteRoom (excuse the horrific pun in this post’s title). 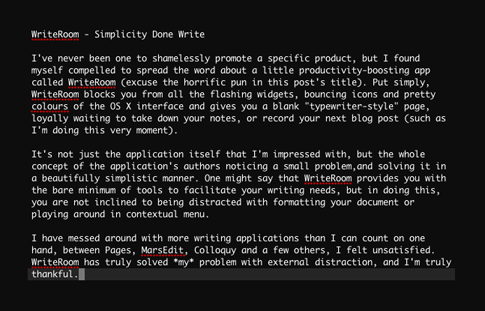 Put simply, WriteRoom blocks you from all the flashing widgets, bouncing icons and pretty colours of the OS X interface and gives you a blank “typewriter-style” page, loyally waiting to take down your notes, or record your next blog post (such as I’m doing this very moment). It’s not just the application itself that I’m impressed with, but the whole concept of the application’s authors noticing a small problem, and solving it in a beautifully simplistic manner. One might say that WriteRoom provides you with the bare minimum of tools to facilitate your writing needs, but in doing this, you are not inclined to being distracted with formatting your document or playing around in contextual menu. I have messed around with more writing applications than I can count on one hand, between Pages, MarsEdit, Colloquy and a few others, I felt unsatisfied. WriteRoom has truly solved *my* problem with external distraction, and I’m truly thankful. Note: If you’re a Windows user looking for a text-editor in the same vain as WriteRoom, check out its win32 cousin Dark Room. I’ve never really been one to enjoy reading, at least analogue texts, but I just couldn’t resist the temptation to add a couple of Design Books to my underpopulated bookshelf. A couple of days ago I received a nice little package from Amazon.com, enclosed was the classic usability bible Don’t Make Me Think by Steve Krug, and Bulletproof Web Design by Dan Cederholm. Both books are useful, if not at least interesting in their own right, however I simply can’t help but feel dissatisfied after reading (glancing) through each. Perhaps its just that I’m a practical learner, I require visual and interactive stimulation in order to get the ‘ole brain sparked up. Or perhaps I simply don’t have the patience required to sit down and read the things. Don’t get me wrong, I don’t have any issues with scholarship, I have do have a thirst for knowledge, but I doubt that traditional books will ever be able to quench this. Whoever said it was tough to find Web Design jobs? I’ve rounded up a list of 6 of the best online Job Boards for Web Design and other Digital Creative positions, freelance or permanent. Using this list (assuming you are skilled enough at your craft) you should have no excuse not to get out there and secure your next job! FreelanceSwitch has a wonderful Job Board, focused on Freelance positions. Krop offers a great to-the-point list of “Creative & Tech Jobs”. Jobs & Gigs uses the clever idea of separating “Jobs” (permanent employment) and “Gigs” (contract-based work) in a well-designed list. Cameron Moll brings you Authentic Jobs, a Design and Development Job Board that also features a great Dashboard Widget, and advertises positions for some high profile companies. Corofloat‘s Job Board is very frequently updated and extensive. Traditionally, “Design”, including that of the Web variety has been taught in Schools and Universities as a strict and specific progress involving stages boiling down to (typically) 1: Planning – 2: Development – 3: Delivery, but is this really the most efficient way to work? Design is such a subjective field, but do the gung-ho tactics of many designers yeild the same results as those of designers who spend their time working in “pre-design”, carefully planning their next moves? In preparation for this article, I have been attempting to contact some of the more well-known icons of the Web Design community, in order to find out exactly how they conduct things. The responses I received were quite varied, and a couple were pretty surprising. So actually, I’m one of those guys that don’t do much paper sketches. Especially when it comes to UI design. Unfortunately I don’t know if I kept any of the drafts on designs I’ve completed. I do believe using paper is incredibly important, and I’m actually about to write up a post about some of my ideas that I’ve been using. I’m actually at the point where paper rivals the amount of design work I do with my computer. In fact, at this point, I might say that paper has over-taken my computer as my primary design tool of choice. I’ll generally spend hours exploring and fleshing out ideas before I do anything at all on the computer. Then, depending on the project and my responsibilities for that project, I’ll turn the paper version into either wireframes, a comp, or even working code.I’ve found the use of paper to be a far superior way to come up with solutions. It’s much less focused on constraints and allows me to be significantly more creative. Unfortunately, I’m not a sketcher. I sometimes do little doodles when coming up with ideas for logos but I tend to play in Fireworks more than hand draw. I also made a few posts on a couple of Web Design-related forums, namely Mint Pages and my.9rules notes, the replies were not in vast quantity, but at least the responses can be used as a probe into the Design community’s general consensus. Sometimes I get a design instantly, or just open photoshop to “doodle” and *bam* it’s there. Other times, it takes a couple of weeks to brew (if I have the time) in my mind, then countless tiny sketches and perhaps a couple of large (a4-filling) sketches or worked-out drawings, and then I bring it to photoshop. I do both ways varying on the time and place. I actually don’t like to sketch, it distracts me. I tend to zone out and let the idea process “sketch it out” in my head. My Design teachers HATED this and tried to dock me points on projects for lack of “brainstorming” but the dean wouldn’t let them as my end results were on par or better than those who HAD sketched. I’m a real hands-on/visual person, so seeing things befone-hand is important to me, however, I often have a hard time putting my ideas on paper. So I’ll often start sketching out (sometimes just outlining) the project/idea, then finish I’ll it off in my head. Though, add in the fact that I’m horribly forgetful, and then you can have quite a mess…so even though it can be a hassle for me to write stuff down and sketch it all out beforehand, I usually find that my projects turn out much better once I’ve brought them down to earth enough to have them written out on paper. The word “design” says it all. You’re not a designer unless you create a project and follow the steps necessary to render it properly. I usually go through a stabilished set of steps – sketch, test, render, test, deliver. Apparently I am the oddball…I don’t sketch anything…I head straight for Photoshop to begin my mockups. I, unfortunately, have very little talent for drawing, so sketching isn’t much help unless I am away from a computer and trying to describe the design to someone. I am not saying I have NEVER sketched, just that it isn’t in my standard process. Is the design process dead? I was absolutely shocked to find out that most of the “top” Designers I queried revealed that they did very little to no on-paper planning before jumping into a design. I might add that I myself have been a proponent for “gung-ho” design tactics, and frequently work of bursts of inspiration rather than carefully planned work but I always assumed that this method was frowned upon among the community, I thought that I would be better off with sticking to the tried and tested generic design process… perhaps I was mistaken? The answer to the question of “which is better?” is anything but clear-cut, and I can only respond by pointing out that everybody eventually discovers what “works” for them, people, by nature, simply think in different ways, some (mainly those who are more creatively-inclined) are motivated by their inspiration, others (primarily the more academically-minded) rely on a structured and careful approach, and you know what… as long as the client (or the Designer themselves) is happy, we need not worry ourselves about the process itself. I can only wish that the results of this article were a little more definitive, but in an industry as subjective as the one we work in, no methods can truly be labeled as optimal. I recommend trying your hand at working from each approach in turn, and you will soon discover which one you are more comfortable with. Even if you have been a life-time subscriber to one school of thought, only good things can come from investigating other means of production. Starting right back on page one, we must first cast our minds back to the year 2004, when the term “Web 2.0” emerged. So, what exactly is Web 2.0? Now, there’s one question that has (over time) become needlessly difficult to answer, however the original definition should still ring true. The term “Web 2.0” was coined by Tim O’Reilly, and has in recent times, unfortunately drifted into the realms of been closely associated with superfluous trends and pointless buzzwords. Perhaps what should be taken from the above quote is that Web 2.0 is about poor spelling, terrible grammar and improper punctuation. So, we have established what exactly the term “Web 2.0” is supposed to mean, but how did this term become so colloquial, while deteriorating into a vague simile? We have seen many sites that may be perceived as emitting a “Web 2.0” image, such as Digg and Flickr, and these only furthered to promote a narrow-minded outsider perception of “Web 2.0”. To me, “Web 2.0” simply defines a natural shift in the way we should think of the web. It stands for the introduction of new technologies, asynchronous and cross-site data access and a community-centric focus. In lamen’s terms, I believe Web 2.0 (among other things) is a vehicle for offering digestible content, and harnessing the mob mentality. I will do my best not to refer to “Web 2.0 Design” in the following passages, as I feel “Web 2.0” and Design (while in many cases working hand-in-hand) simply should not be associated with such a tight dependance. My preferred term is “Contemporary Web Design”. There are many aspects of “Web 1.0” that I truly will not miss (namely splash pages, popups, background music and flash animated navigation), however it is still upsetting to see the vast number of “designers” who find it necessary to answer to trends and perpetuate the existence of pointless, ill thought out and trendy design. The following are things that irritate me in the highest order, feel free to alert me of other 2.0-annoyances. And now, as a kind of sign-off, for your personal enjoyment; a couple more completely misguided minds will enlighten you with their thoughts on the “Web 2.0 Style”. Lifted from blogs and subsequent user comments. 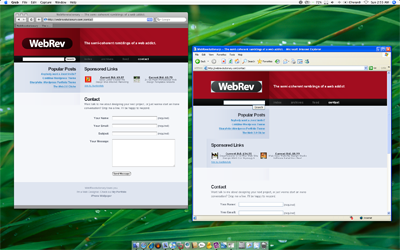 I love web 2.0, and I don’t wanna be a jerk… but I’d like to point out that the web 2.0 style is very closely related (in fact, almost a copy of) apple’s “Aqua” interface style. If you take anything from this article, anything at all, I hope it would be to attempt to help in the phasing out of the term “Web 2.0”. It’s time we as an online society move onwards and upwards, and instead of wasting our time trying to jump on the bandwagon of fledgling fads, we should focus on innovating, and making the next technological leaps towards the future. The true meaning and philosophy that was once held by this term has now degenerated to a meaningless cliche, it’s time to move on. Anybody Want a Joost Invite? I’ve been using Joost for a little while now and am convinced that it’s definitely going to be a big part of the future of internet TV. Make a comment on this post with your email, and I’ll send you an Invite. There are many great clothing sites out there, but a couple really stand out for me; Funkrush and Threadless. The prototypical customer for each site would probably be a designer themselves, and would appreciate some of the wonderful illustrative works featured on these t-shirts. Threadless has really built up an entire community around t-shirt designs. Any designer who thinks they’re worthy can make an account and start submitting their works, and the designs that make the cut are chosen by the community. Designs must receive a certain rating from the community before they’re printed. This process seems to work well, and it’s obvious that a lot of thought has gone into making Threadless as community-driven as possible. Funkrush takes a different approach to design. Their workforce mainly consists of well-known and respected illustrators from online communities. This ensures that only great quality designs are churned out, and seems to work great! I was recently browsing through the my.9rules notes, and I stumbled across a post penned by a ‘ruler who was irritated by applications that have their own non-standard GUI (think Windows Live Messenger). I realized that it was something that has been irritating me for so long. If you”re not quite sure what I”m on about, here are a couple of screenshots of the worst (Windows) perpetrators. 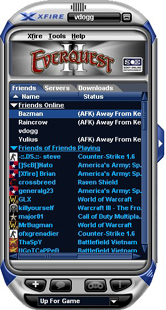 From top to bottom: Xfire, Steam, Windows Live Messenger (previously MSN Messenger), Ad-Aware and AIM Triton. 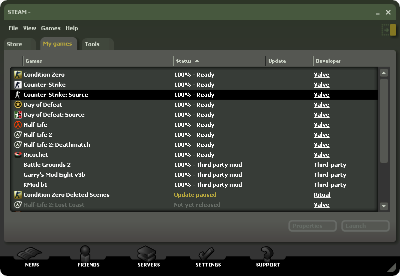 I hate having my OS”s GUI broken up by non-standard graphical layouts. Since when was the standard GUI inadequate even for Microsoft”s own applications?! Speaking of counter-usibility, Windows Live Messenger would have to be one of the most un-accessible applications I”ve ever had the misfortune to use, and now that MS has slowly phased in a “Vista” aesthetic, it sticks out like a sore (and ugly) thumb on my XP Desktop. I”m definitely in no hurry to upgrade to Vista, I had a short experience with it, but uninstalled it within a week due to it”s incompatibilities, terrible look and a slew of other issues. I”m just glad I have my trusty Mac here to serve as my main computer, and I”m thankful that I don”t have to use XP/Windows on a daily basis. I’ll be the first to admit it, I just find Twitter irritating. There’s just something in me that doesn’t make me interested in hearing the mundane information about people’s lives. Especially when it’s fired at you at the rate of “Tweets”. Sure, it’s a fine concept, and it’s obviously caught on with some degree of success, but I’m simply not interested in that sort of thing. I must confess, I did make a Twitter account, just to try the thing out. It lasted for all of 10 minutes. I just don’t know if any good things can come from a community which is centered around “ping” type updates, of little value. And speaking of the “new wave” community sites, Virb is not my cup of tea either. I’m already a part of Myspace (just for my “real life” friends. I do have some :)), many forums, Digg, YouTube and actively comment on as many blogs as I can, and I think that’s just about enough. These days there are just so many social networks and groups to be a part of, and Virb (to me) is just one too many. When I begin to think more deeply about it, I struggle to find any advantageous purpose for these social-networky sites. Sure, it’s great to have connections, but between LinkedIn, Myspace, Virb and Twitter (just to name a few of the more popular ones), we are really overly spoiled for choice. One minute you just *have* to be a part of Myspace, then weeks later, your friends are asking you to join Virb, what’s next? Each new network seems to be “Newer, Cooler and Better!”. There really should be one, single, definitive network that connects everyone in a balanced and generic way. Not thousands of sub-par networks which are populated and deserted on a whim. Fads come and go way too quickly, so the internet may not be the place for making meaningful and lifetime connections. Call me old fashioned, but I’ll stick to my real life social networks. Even if I don’t have 5,212 friends.